This past Tuesday, February 24, I was thrilled to have opportunity to, once again, give my presentation about Classical Islamic Poetry. Beaux Pettys, a fellow member of the Burns Club of Atlanta, saw my presentation back in August and invited me to speak on the same subject in front of the Gate City II masonic lodge in downtown Atlanta. As at the Burns Club, my program looked at the classical period of Islamic poetry, using a small handful of notable Arab and Persian poets to explore the most common themes of the genre: from uniquely Middle Eastern devotional works to familiar romantic styles, tavern poems, and satires. 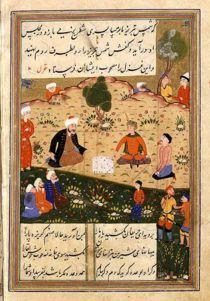 This program aimed to demystify an often-adversarial culture through verse, the most celebrated art form in the Islamic world, and provide historical perspective, demonstrate Islam's impact on Western literature, and illustrate the shared human issues poets of both the Middle East and West addressed. I got interested in the genre while studying Arabic at UGA while working on my MA in history. But rather than deliver an academic lecture, this presentation is meant to be light, focusing on the poetry rather than the sometimes-touchy issues associated with Islam and the current conflict with the West. But it is my hope that the poetry of the classical period can serve as a good backdoor to help humanize and understand Islamic culture. All that said, what would a good post about poetry be without a poem or two. I fared then to the scene of the Prophet's experience of a great divine manifestation only a 'two bow-lengths' distance from him' but God was not there even in that exalted court. But as I often prefer to wax comedic, I am drawn to the more humorous or bawdy poems of the period. Some of these I've quoted before. But the following poem, by a caliph no less, always seems to surprise folks with it unapologetic, risque tone. her limbs full, her mouth fragrant like musk. “It is time to part,” and grief almost overcame her. Then I left her and no one knew of us. May God reward her for her good deed. and keep far from me the doom of repentance. from Tom Leidy -- Congratos! I thought he'd be green. Maybe he'll ripen.